It is a three hour drive from Seoul-a long way. It became a private tour to us. Our tour guide Steven was great! He explained things clearly and very informative. The village itself is a little lack of maintenance but we enjoyed the time there. It was a long drive from Seoul to Andong and back. Thanks again Steven!! We thoroughly enjoyed this tour and especially our guide. He picked us up in a private van from our hotel. He was knowledgeable about Korean history, current events, sights, religions, and of course the tour itself. We stopped for a great lunch at a local restaurant where we had Korean traditional meal overlooking the valley and hundreds of huge pots fermenting beans - spectacular. It is a long day, so wear comfortable clothes. Enjoy! This is one of my favorites place during my visit in Korea. The village is well preserved with a very beautiful scenery. Unfortunately we missed the cherry blossom which would have make the view even more beautiful. Our guide Mr. Lee is a very nice and friendly person. He explain lots of things till the end of the tour. I will certainly recommend this tour to anyone who like seeing beautiful scenery and cultural heritage. This was our favorite tour of our trip to Korea. Let me tell you why.. Despite having a 3 hour drive to get to the Andong region and back every minute at the sites were well worth the visit. We first got a gorgeous view of the Hahoe Village from a nearby cliff face after a short hike. Following that we stopped off for a truly spectacular lunch. It was a different style of Korean BBQ and we reckon that this was our favorite meal while on our holiday. Next came the Hahoe Mask Museum where we learned about the origin of the Korean painted masks and were treated with a display of masks from around the world. Finally we were shuttled over to the Hahoe Village and entered the winding streets. This is a living Korean folk village where the houses remain traditional and we rarely saw any signs of modern living minus cars and some electrical wires. Several of the homes had opened their courtyards so that people could see more of the beautiful structures. 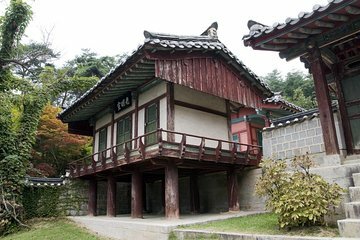 Lastly we visited an old Confusion Temple that was truly beautiful and learned more about this influence on the Korean way of life. We had the same guide as on a previous trip and really enjoyed traveling with him. He spoke constantly giving us great history and background, both modern and ancient, of everything we were seeing. He was great in taking photos and actually getting us both into a photo which for my boyfriend is often near impossible. Wonderful day tour with so much to see and learn. I had a fantastic guide called Lee from Kim's Tours who looked after me very well and answered all my questions. Pick up from my hotel and drop off was very smooth. A highly recommended tour. Kim Travel was absolutely amazing. Their tours were the best tours of all that we went on while visiting South Korea. The guide was very knowledgeable and we really felt they went out of their way to go above and beyond to teach us about their culture.